Among present non-destructive methods for concrete evaluation, ultrasonic testing uses relatively short wavelengths and therefore has particular potential for detailed assessment of concrete. Especially a tomographic method like SAFT reconstruction (Synthetic Aperture Focusing Technique) is able to provide high-resolution images of concrete areas. In a publication for the 1995 NDT-CE conference entitled "Towards SAFT-Imaging in Ultrasonic Inspection of Concrete" , the author introduced an implementation of the SAFT algorithm and gave initial examples of its application to concrete. The present contribution summarizes progress that has been achieved for this method since then. Developments include measurement techniques, signal and image processing schemes, and quantitative image evaluation. For easy comparison of the effects of the proposed methods, most examples are illustrated using results obtained at only two different test specimen. Finally, the current potential of ultrasonic SAFT-imaging and remaining steps necessary to open broad practical application are described. Ultrasonic pulse-echo testing is an established technique for the detection of internal objects in metals and other materials. The application to concrete, however, faces problems induced by the inhomogeneous concrete structure. Aggregate and pores have acoustical properties much different from those of the cement matrix, which gives rise to scattering and mode-conversion of propagating ultrasonic waves. Among the consequences are pulse attenuation and structural noise, which can mask reflections of objects to be detected. In addition, a wide divergence angle is caused by a low ratio of transducer diameter to wavelength, complicating localization of objects. To apply the one-sided pulse-echo technique to concrete testing, it was necessary to develop low-frequency transducers with sufficiently short impulse responses. With the introduction of such transducers and instruments in the beginning of the 1990s, recording of single (A-scan) and multiple (B-scan) measurements was made possible. It soon turned out that the suppression of structural noise would be crucial. This was the starting point for adopting the SAFT reconstruction technique for this purpose. SAFT images show object indications at their correct position, are therefore easy to interpret, and can suppress structural noise by exploiting spatially diversified measurements. The work described here is based on the SAFT implementation first published in . An overview of this and other SAFT algorithms used for concrete can be found in . Ultrasonic SAFT (Synthetic Aperture Focusing Technique) reconstruction is an imaging method utilizing the information content of many single measurements. The underlying algorithm coherently superimposes time-dependent A-scan measurements recorded along an aperture to each element of the image. This way a transducer of the size of the aperture with variable focusing to each image element is synthesized. Linear apertures lead to two-dimensional images, planar apertures to three-dimensional images. Indications in SAFT images are reconstructions of object boundaries and need to be interpreted using additional information. SAFT reconstructions provide detailed information about the imaged concrete section and can therefore be used for detection and localization tasks. The method is explained in greater detail in , where also ultrasonic wave propagation in concrete is qualitatively explained. Fig 1: Sectional view of a test specimen (left) and its SAFT reconstruction (right). The left part of Fig.1 shows the cross section of a test specimen containing two transverse drillings. The specimen, already examined in , has a maximum aggregate size of 8mm. Ultrasonic A-scan measurements were taken alongside the top of the specimen and processed by the SAFT algorithm. The result is displayed in Fig.1, right. Two separated indications represent the drillings. The back wall is also visible as a horizontal line, partially shadowed by the drillings. While this result can be regarded as a good SAFT image, it suffers from a number of drawbacks. First, each drilling indication has a different brightness, and both are not logically related to that of the back wall indication, which should be a stronger reflector than the drillings. Then, strong noise superimposes the image that also decays with depth. Thus this SAFT image is only the starting point for a number of signal processing steps intended to increase image fidelity, make the image easier to interpret, and extract quantitative information about the imaged objects. Reconstructed SAFT images need to have an even brightness distribution in order to be easily interpreted. To compensate for the decay of the signal amplitudes with depth, two approaches have been used. One utilizes measurements taken at reference reflectors, the other is based on noise statistics. Reference reflectors located at different depths can be utilized to build a depth correction curve . The amplitude of each reflector is measured, and the resulting depth-dependent curve is inverted to yield the depth correction. This scheme is known from ultrasonic fault detection in steel where it is used to size defects from amplitude readings. For two-dimensional SAFT images of concrete, objects elongated perpendicular to the image plane can be employed as reference reflectors. Experiments carried out so far resulted in exponential correction curves . For the example in Fig.2, left, the amplitudes of the drilling indications in Fig.1 are balanced. Compared to the original SAFT image in Fig.1, right, both drilling indications now have the same brightness, and the indication of the back wall is clearly visible. In general, depth correction based on reference reflectors yields curves valid for the type of concrete at hand. The amplitude relation between small, unknown objects and the back wall can be used to size the objects. In the second approach to depth correction, statistical parameters describing the structural noise are equalized [4, 5]. In a region of the original SAFT reconstruction only containing noise, each row is taken as a sample, which is then statistically analysed. To this end, parametric modelling of the probability density function by Weibull and LogNormal functions has been used, but also simpler measures may be adequate . The course of the selected parameter over depth is approximated by a quadratic regression curve and then inverted to yield the depth correction. This procedure was applied to the original SAFT reconstruction in Fig.1, right. In the result in Fig.2, right, structural noise amplitudes are evenly distributed over the whole image, and all object indications are clearly visible. 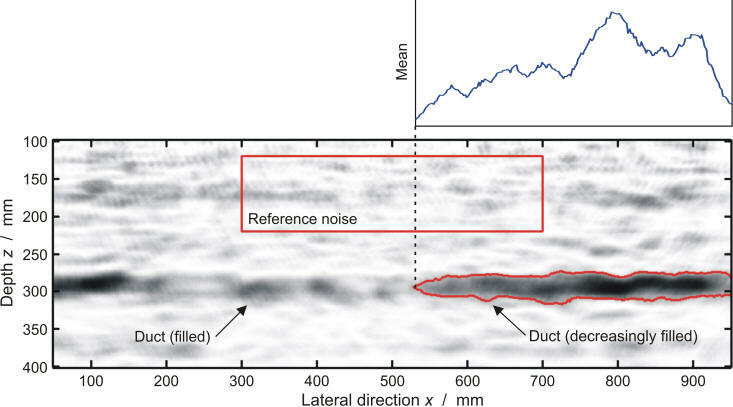 In this case, object amplitudes are a detection quality measure since they are directly connected to the signal-to-noise ratio (SNR) over constant noise. It is by chance that both drilling indications possess similar amplitudes - this is generally not the case. Because depth correction based on noise statistics leads to images easy to interpret, it is used on all further images except where noted. Fig 2: Depth corrected SAFT reconstructions using reference reflectors (left) and noise statistics (right). Scales are as in Fig. 1, right. Among all elements in the measurement chain, ultrasonic transducers are most influential on amplitude and frequency content of the transmitted signal. The transducer used for an actual measurement needs to be chosen in accordance with the given concrete and the evaluation task. Low frequency waves are less affected by attenuation and structural noise, and may be employed for coarser, more porous concrete and larger depths than higher frequency waves. But they have limited resolution and cannot be used to detect small objects. Because pulse-echo testing relies on the excitation of short pulses, the transducers are required to have a large bandwidth. Bit it is difficult to develop transducers possessing both a low frequency spectrum and a large bandwidth. While in 1995 the lowest peak frequency of transducers with a relative bandwidth of more than 100% was 400kHz , it is now lowered to 200kHz. With these transducers measurements as low as 50kHz are possible. Transducers with nominal frequencies lower than 200kHz are available, but possess considerably lower bandwidth thus limiting resolution. With these newly developed transducers coarser, more porous concrete and larger depths are accessible. An example is shown in Fig.3, which on its left depicts the prior result of SAFT imaging a similar test specimen as in Fig.1, but with a maximum aggregate size of 32mm. Measured with a 400kHz transducer , the SAFT reconstruction is indistinct, and holes and the back wall can only be suspected. For the image displayed at the right, the same specimen was measured using a newer 200kHz transducer . Here all objects are imaged, with only one hole being somewhat less clear. Indications and structural noise appear softer due to the lower resolution. Fig 3: SAFT reconstructions of a test specimen as in Fig. 1, left, but with 32 mm maximum aggregate size using 400 kHz (left) and 200 kHz transducers (right). Scales are as in Fig. 1, right. Coupling transducers to the concrete's surface is the most difficult issue during measurements. The transmission of ultrasonic waves into the concrete directly influences the image quality in many respects, such as signal-to-noise ratio, resolution, and evenness. Additionally, transducer coupling makes up the major part of measurement time, directly influencing whether ultrasonic SAFT imaging can be applied in an economic way. So far, the coupling problem has not been fully solved. It remains the most important challenge before ultrasonic SAFT imaging can be broadly applied. Traditional coupling agents like Vaseline and honey work satisfactorily on smooth concrete surfaces, but they are slow to use and at least Vaseline is hard to remove. In practice, many concrete surfaces are not smooth, and these coupling agents are inadequate. Research on alternative coupling methods has been undertaken for a long time. The most direct and thus most desirable way certainly is dry coupling, i.e. the method of directly pressing transducers against the concrete surface. Commercially available are so-called Dot Point Contact (DPC) transducers . They feature a small contact surface of 2.5mm diameter and are available for shear and pressure waves. Fig.4, left, illustrates a SAFT reconstruction based on shear wave DPC transducers. Measurements were carried out on the test specimen of Fig.1 the same way as before, except that a send-receive configuration was employed using separate probes for transmission and reception. In the resulting image, both holes and the back wall are present, but a low signal-to-noise ration hinders interpretation. This is a concession to the small contact area, which does not average structural noise to smaller values as larger transducers do. Consequently, these transducers are also built into arrays of, e.g., 12 probes, thereby sampling a much larger area and significantly reducing structural noise. Another disturbing feature in the image is the horizontal indication at a depth of z=135...190mm that stems from Rayleigh waves reflected at two edges of the specimen. The increased excitation of Rayleigh waves again is due to the small contact area. Fig 4: SAFT reconstruction of measurements made with dry point contact (DPC) transversal transducers (left) and with longitudinal transducers using water coupling (right). Scales are as in Fig. 1, right. Another possibility is fluid coupling. Fig.4 shows on its right the SAFT reconstruction of the same test piece, measured with water coupling. The result is a very clear image, in which holes and back wall each stand out more than 22dB against structural noise. When comparing this result with Fig.1, right, is should be noted that different transducers with different frequency ranges were used. Liquid coupling seems an alternative if some handling problems can be solved. As was pointed out before, image amplitudes on which depth correction based on noise statistics is applied, are directly connected to the signal-to-noise ratio (SNR) and are thus a quality measure. To distinguish between signal and noise, a detection operation can be introduced that regards amplitudes below an amplitude threshold as "noise" and discards it. In an analogy to Radar detection methods, this threshold can be calculated from statistical noise distribution [7, 5]. Fig 5: Principle of signal detection based on parametric noise modelling (left). SAFT reconstruction of Fig. 2, right, thresholded using Weibull probability density function and 1 % false alarm probability (right; scales are as in Fig. 1, right). Fig.5, left, illustrates this procedure depicting SAFT amplitude histograms of noise (red) and signal plus noise (orange). A parametric model using Weibull or LogNormal probability density functions models the amplitude distribution of a noise region of the image. Given this distribution and a chosen false alarm probability, the threshold can be computed. Finally, all image points with amplitudes below the threshold are discarded as "noise". Fig.5, right, shows the SAFT-image of Fig.2, right, after the thresholding operation. A Weibull distribution and a false alarm probability of 1% were used. Application results so far suggest that noticeable noise reduction can be achieved without significantly changing the shape of indications. This method is also intended as a step toward quality control in image examination. SAFT reconstructions image a section or region of concrete including embedded objects and faults. In quantitative image evaluation, more information is seeked in the images besides the detection and location of objects. Instead, information is gathered utilizing parameters like amplitude, signal-to-noise ratio (SNR), and resolution. Quantitative methods can be combined to represent the information content of images according to objective measures. Amplitudes of imaged objects contain information about the reflection coefficient of these objects. This information can be used to distinguish faulty portions of objects from healthy, as is important for the detection of voids in tendon ducts. Fig.6 displays the SAFT image of a tendon duct partially filled with injection mortar (test specimen by courtesy of Dr. Kroggel, University of Darmstadt, Germany). For x=0...330mm, the duct is completely filled, while for x=300...1.000mm, the fraction of filling gradually decreases to zero. Except for an image artefact on the left side, the decline of mortar filling is reflected by an increasing amplitude, which is displayed here as the mean over the indication in z-direction. Although this effect could not be established in all experiments, efforts are directed towards developing a practicable method for void detection in tendon ducts. Fig 6: SAFT reconstruction of a tendon duct in a test specimen. From x = 330 to 1000 mm filling of the duct decreases causing an increasing indication amplitude. The small plot shows the mean calculated over depth. 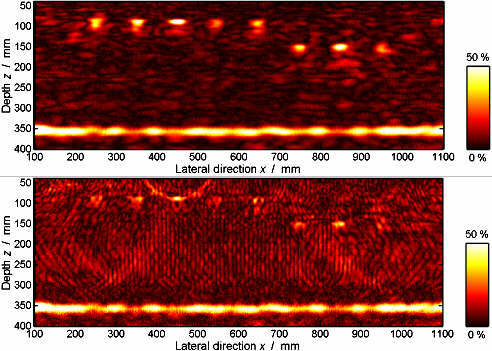 Regular use of ultrasonic diagnosis requires quality assurance of the images. A number of parameters have been defined to objectively characterize the quality of SAFT reconstruction and other types of images . Concerning SAFT reconstruction, the principal imaging properties are of special interest. Systematic measurements have been started at a concrete of 8mm maximum aggregate size, which contains transverse objects of different shapes, sizes, and depths. The SAFT reconstruction of a specimen containing objects with 8mm cross section is displayed in Fig.8. This image (and a corresponding measured from the bottom of the specimen) was evaluated to extract quantitative parameters. Some of the results are shown in Fig.7. On its left side it can be seen that the signal-to-noise ratio of three different targets decreases exponentially with depth. Reinforcement of 8mm diameter can be detected at up to 230mm concrete cover with a signal-to-noise ratio of 12dB. The right side of Fig.7 contains the lateral and axial resolution curves for the object with quadratic cross section. The lateral resolution remains about constant with depth, as long as the object is covered by all aperture positions. The axial resolution is higher (corresponding to lower values), but decreases with depth due to the acoustic low pass effect of concrete. With the establishment of similar dependencies for a range of concrete types, a comprehensive grading of SAFT imaging quality becomes possible. Fig 7: Depth-dependence of signal-to-noise ratio (left) and resolution (right) of different 8 mm lateral objects in a test specimen with 8 mm maximum aggregate size. So far, SAFT reconstruction results are mostly presented as images in which amplitudes are relatively scaled and arbitrary colour maps are used. By a combination of the discussed depth correction and signal detection principles, the information content of images can be represented according to objective measures. To this end, a threshold calculated from parametric noise modelling is used to distinguish "signal" (object indications) from "noise". Then, detected noise is not suppressed, rather a colour scale is calculated such that the level T coincides with a colour change in this scale. All values below T are viewed as noise, being coloured accordingly, and are scaled by depth correction based on noise statistics. Amplitudes above level T are interpreted as object indications. They are depth-corrected according to the method of reference reflectors. In the resulting nonlinear representation, object amplitudes stand out against structural noise by their principal colour. The size of small objects can be estimated by the brightness of the indication. Image content regarded as noise is equalized and can still be seen and interpreted. Fig.8 shows an example. It contains the SAFT reconstruction used for the results in Fig.7. Image amplitudes have been restricted to 25% to preserve visibility of these small objects at a linear scale. In addition to the eight targets, some artefacts mostly originating from mode conversion are visible. Fig 8: SAFT reconstruction of a specimen containing eight 8 mm targets. Object in-dications and noise are distinguished by a colour change at level T. Two types of depth corrections are applied (see text). During the measurement and reconstruction processes, image degradations and artefacts may be introduced. "Artefacts" are named unwanted indications that do not have a physical counterpart. Some important SAFT-related artefacts are connected to aperture properties such as aperture length and grid interval. Since these parameters directly influence measurement time, it is important to understand the cause of artefacts and to find a compromise between an effective measurement procedure and image fidelity. Fig 9: SAFT reconstruction of a test specimen containing eight 16 mm targets. Measurements are done at 5 mm (top) and 20 mm (bottom) grid intervals, the latter causing image degradation and artefacts. As an example for some of the possible image degradation, in Fig.9 the SAFT reconstruction of a test specimen containing eight 16mm targets is depicted. Except for the size of the objects, the specimen is the same as the one imaged in Fig.8. Changing the aperture grid interval from 5mm (top) to 20mm (bottom) results in an increased signal-to-noise ratio, a deformation of object indications, and the appearance of artefacts. Some sorts of artefacts may be reduced by signal windowing in the space-frequency domain, which is subject of current research. To date ultrasonic SAFT reconstruction has found a number of practical applications. The measurement equipment is already small enough to be carried to construction sites such as the bridge box shown in Fig.10. Here, measurements were made at concrete walls and the floor. One of the floor results is displayed in Fig.11, left. To ease interpretation, signal detection based on parametric noise modelling was applied. Thresholding was used the same way as for Fig.5, right, employing a Weibull probability density function and 1% false alarm probability. The final image was interpreted adding information such as the expected tendon depth and size (Fig.11, right). Back wall shadowing can be used for object sizing. Finally, detected objects include tendon ducts, reinforcement, supports, and one unknown object. Additional applications of one-dimensional, two-dimensional, and three-dimensional SAFT reconstructions can be found in . 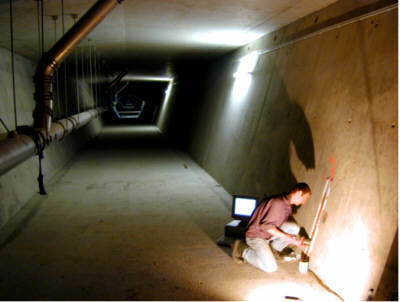 Fig 10: 10 Ultrasonic measurements inside a pre-stressed concrete bridge. Fig 11: SAFT reconstruction of a pre-stressed concrete slab (left) and after statistics-based thresholding and interpretation (right). The described SAFT reconstruction algorithm as well as additional signal processing schemes have reached an adult state and are ready to be applied in the field. In contrast, parts of the measurement process, especially the tedious transducer coupling to the concrete, still pose problems. Conventional coupling agents do not seem to be adequate. Other methods - dry coupling or other coupling agents - are becoming available, but so far the procedures are not fully controlled. When these difficulties can be overcome, applications of practical interest can be approached. Possible applications for a first step are thickness measurement, detection and location of tendon ducts, and, in certain cases, location of reinforcement. Here SAFT reconstruction using appropriate measurement equipment is promising to be of ease use and to yield reliable, high-resolution solutions. A number of further problems such as filling of tendon ducts, crack depth measurement, and honeycombing still need principal research. Part of this work was supported by the Deutsche Forschungsgemeinschaft (German Research Council). Cooperation within the framework of the research initiative FOR 384 is particularly acknowledged (www.for384.uni-stuttgart.de). Some of the measurements were carried out by U. Tümmler. M. Schickert: "Towards SAFT-Imaging in Ultrasonic Inspection of Concrete"; International Symposium on Non-Destructive Testing in Civil Engineering (NDT-CE), Berlin, 26.-28.9.1995. Berlin: Deutsche Gesellschaft für Zerstörungsfreie Prüfung (DGZfP), 1995, 411-418. M. Schickert, M. Krause, W. Müller: "Ultrasonic Imaging of Concrete Elements Using Reconstruction by Synthetic Aperture Focusing Technique". Journal of Materials in Civil Engineering 15 (2003) 235-246. M. Schickert, J.D. Schnapp, O. Kroggel, R. Jansohn: "Ultraschallprüfung von Beton: verbesserte Objekterkennung durch stochastische Methoden"; DGZfP-Jahrestagung 2001, Berlin, 21.-23.5.2001. Berlin: Deutsche Gesellschaft für Zerstörungsfreie Prüfung (DGZfP), 2001, CD-Rom, V44, w/o pagination. R. Jansohn: Amplitudenstatistik zur Bewertung von Ultraschallrückstreusignalen bei Beton. Dissertation at the Technical University Darmstadt, Germany. Aachen: Shaker, 2000. A.A. Samokrutov, V.N. Kozlov, V.G. Shevaldykin, "Ultrasonic Defectoscopy of Concrete by Means of Pulse-Echo Technique"; 8th European Conference on Non-Destructive Testing (ECNDT), Barcelona, 17.-21.6.2002. Madrid: Spanish Society for NDT (AEND), CD-Rom, 2002, 1-9. R. Jansohn, M. Schickert: "Objective Interpretation of Ultrasonic Concrete Images"; 7th European Conference on Non-Destructive Testing (ECNDT), Copenhagen, 26.-29.5.1998. Broendby, Denmark: 7th ECNDT, 1998, Vol.1, 808-815.